The landmark legislation known as the Patient Protection and Affordable Care Act (PPACA), signed into law in 2010, is likely to affect virtually every person and institution in the United States in some way. 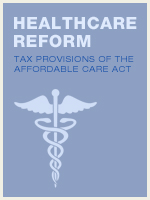 It imposes healthcare-related requirements on health plans, health insurers, employers and individuals. In addition to imposing various tax increases to increase revenue, the PPACA uses a carrot and stick approach to ensure compliance with its provisions, offering tax credits for compliance and imposing tax penalties for non-compliance. This course will review the principal provisions of the law and will examine its tax impact on individuals and businesses. Tax credits and tax penalties authorized to help enforce the PPACA requirement that individuals maintain minimum essential coverage. Describe the tax credits and tax penalties designed to help ensure that individuals meet the requirement to maintain minimum essential coverage.